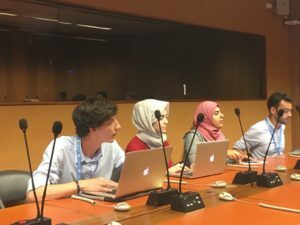 On 4 July 2018, on the occasion of the 38th session of the Human Rights Council, COJEP International, the International Center for Justice and Human Rights, the Alkarama Foundation and the International Campaign for Freedom WATER (ICFUAE) organized a parallel event at the Palais des Nations. 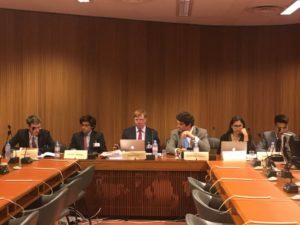 The purpose of the discussion was to adopt the UPR final report by the United Arab Emirates (UAE) and results from the 3rd UPR. Ines Osman, legal coordinator of the Alkarama Foundation, moderated the panel discussion on the explanation in his final report that the United Arab Emirates accepted 132 recommendations and took note of 98 recommendations. Some speakers noted the contradictory position of the government. While the government accepted the general recommendations, he did not note the recommendations and practices, which raises questions about the seriousness of the state in suppressing human rights violations in the country, including frequency violations after January 2018. Years of imprisonment and the use of torture against women in UAE prisons, as it was the case for Amina Alabdouli and Maryam al-Balushi. 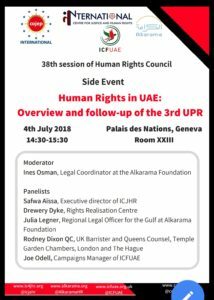 The Rights Realization Center also expressed dismay at the UAE’s rejection of the UPR recommendations. 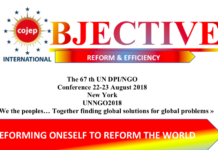 There is an accountability mechanism in the UAE and a call to the country to adhere to the international covenant on rights and policies and the responsibility of the special rapporteur to visit the country.